When this small eastern tailed blue butterfly perches on a leaf and rubs it wings together, the thread-like “tails” on its wings (at lower right) look like moving antennae, and the nearby orange “eye-spots” look like eyes. This disguise protects the butterfly by tricking birds into attacking the edge of the butterfly’s wing instead of its head or body. Along with the summery weather that finally arrived in August came some late-summer butterflies in their usual disguises. They make a welcome sight after cool rainy weather put a damper on the best of butterfly season in early July. But butterfly disguises? Fluttering around in broad daylight, often as colorful as the flowers they visit for nectar, many butterflies hardly seem disguised. Unlike their night-flying relatives, the moths, most butterflies seem pretty obvious to us. That’s the catch. We’re not the creatures that butterflies are hiding from. Birds are typically the problem for butterflies. They’ll eat butterflies. We can see small blue butterflies along trails in Westborough throughout the growing season, from April through September. They’re known, not surprisingly, as “blues,” and we have a couple of different kinds. In August and September, you’re most likely to see the eastern tailed blue (Everes comyntas). It’s only half an inch in size and often flies low, near the ground along a path. If you spot an eastern tailed blue, you’ll probably notice one of its disguises – the one that its colors create when it flies. It’s deep blue on top, so it looks blue when its wings are open, but it’s light blue-gray on the undersides of its wings, which show when its wings close. These colors alternate as it flutters its wings in flight, making it hard for you – or any predator with an appetite for butterflies – to track it, or even to recognize it as a butterfly. 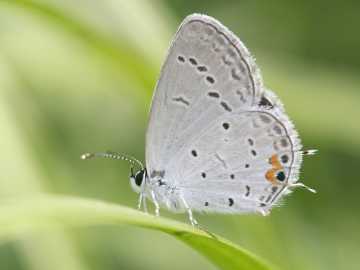 The eastern tailed blue butterfly has another disguise that’s meant especially for birds. When it perches on a leaf or flower, as it may do when taking nectar or watching for a possible mate, it sits with its wings folded. In this position, it’s hard for birds to tell where the tasty head and body are located. What creates this confusion? The name of the eastern tailed blue butterfly gives a clue: The thin, thread-like “tails” on its back wings can look like antennae. This butterfly is also in the habit of rubbing its wings together when it perches, making the thin “tails” move, much like antennae. To add to the deception, the butterfly has a pair of bright orange “eye-spots” near the tails. Hungry birds target the eyespots and false antennae, but they come away with a beak full of wing. If you see an eastern tailed blue without its tails, or with gaps along the edge of its wing, you can guess what probably happened – but at least the little butterfly got away. This viceroy butterfly and the monarch butterfly look very much like each other (but only the viceroy has the black line across its rear wing, shown here). To birds, neither butterfly is good to eat, and both sport the same orange and black “warning colors” that tell birds to avoid them. Eastern tailed blues aren’t the only butterflies with this type of disguise. It’s so effective that a large group of small butterflies shares it. They’re known as hairstreaks because of their hair-like tails that can look like antennae. To get a really good look at these disguises, it’s helpful to look through close-focusing binoculars or a single-barrel macroscope. Both are great for butterfly-watching and give better views of butterflies than we normally get with the naked eye. Another butterfly that we commonly see at the end of the summer is the orange-and-black viceroy (Basilarchia archippus, Limenitis archippus). 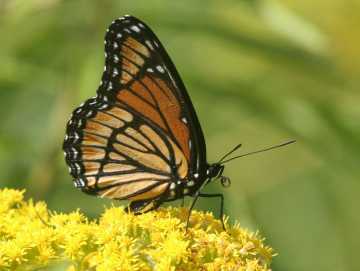 It’s about 2 inches in size and well known for looking like the monarch butterfly (Danaus plexippus). Together, the viceroy and the monarch advertise that they’re not good to eat. In essence, the very conspicuous viceroy and monarch butterflies are disguised as each other. They’ve come to look like one another, and neither one is good to eat. Viceroy butterflies taste bitter to birds and may be slightly toxic, thanks to aspirin-like chemicals in the willow leaves that their caterpillars eat. Monarchs are so toxic that they make birds sick, due to chemicals in the milkweed that monarch caterpillars consume. After a taste of either butterfly, birds quickly learn to avoid both. Caterpillar or bird dropping? Viewed from farther away, this viceroy caterpillar looks like an aging bird dropping, so birds ignore it. This disguise helps the caterpillar survive to become an adult viceroy butterfly. But to enjoy the protection of its “warning colors” of orange and black – which are also the warning colors that many bees and yellow-jackets wear – a viceroy must become an adult butterfly. 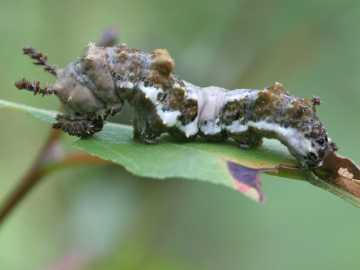 Before then, it has to survive its earlier stages: egg, caterpillar, and pupa. Unlike the monarch caterpillars, viceroy caterpillars haven’t yet built up enough bitter chemical in their bodies to be distasteful or toxic. Fortunately, viceroy caterpillars have a different disguise: they look like bird droppings. As the photo shows, they’re an odd mix of black, brown, and white colors, shiny and dull areas, spiny horns and strange bumps. From a distance, they look just like aging bird droppings on a leaf. They also remain still during the day, since they do most of their eating at night. Most birds are fooled and pass them by. The viceroy’s protective disguises don’t end there. Viceroys have yet another deceptive appearance when they start life as eggs. The egg is small and green, and single eggs get laid on leaf tips. The egg looks very much like a tiny leaf gall – a bump made of leaf tissue, rather than a nourishing egg. Again, insect-eating birds are often fooled. So keep your eyes open for butterflies in disguise, and enjoy whatever else you might see in nature as summer draws to a close.